Selected Rings, Pendants and Talismans made available to Gemstoneuniverse.com patrons in April 2019. For those whom nothing but the Best will do – this is the Emerald for you from the Lot Samarjit. This rare Colombian Emerald is simply at the apex of the Gem Pyramid this Emerald will bring appreciation and compliments in any part of the world. The beauty of Color is supreme and cannot be expressed in words. View the video of this super premium quality Emerald that holds the promise of taking your life to a different orbit all together. A collectible Gemstone that one just transfers from one Generation to another and along with your personal success story and legacy. Very High clarity of 90% and above and beautiful symmetric precision cut make it very desirable. A Gem that comes once in a lifetime. 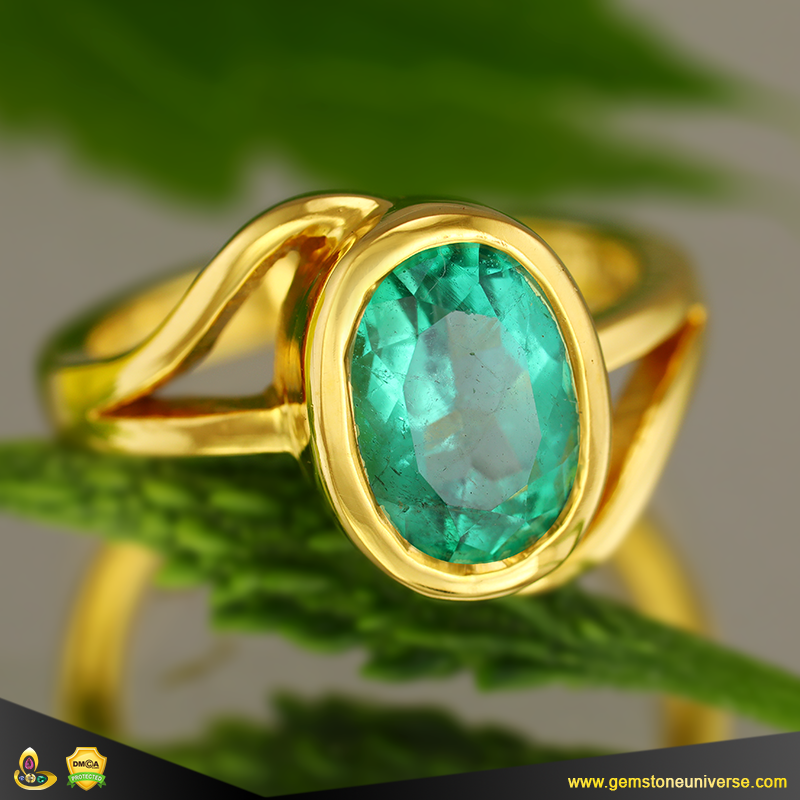 Nature’s generosity is at full display in this very lux Emerald. The story just does not stop at the solid jyotish weight. 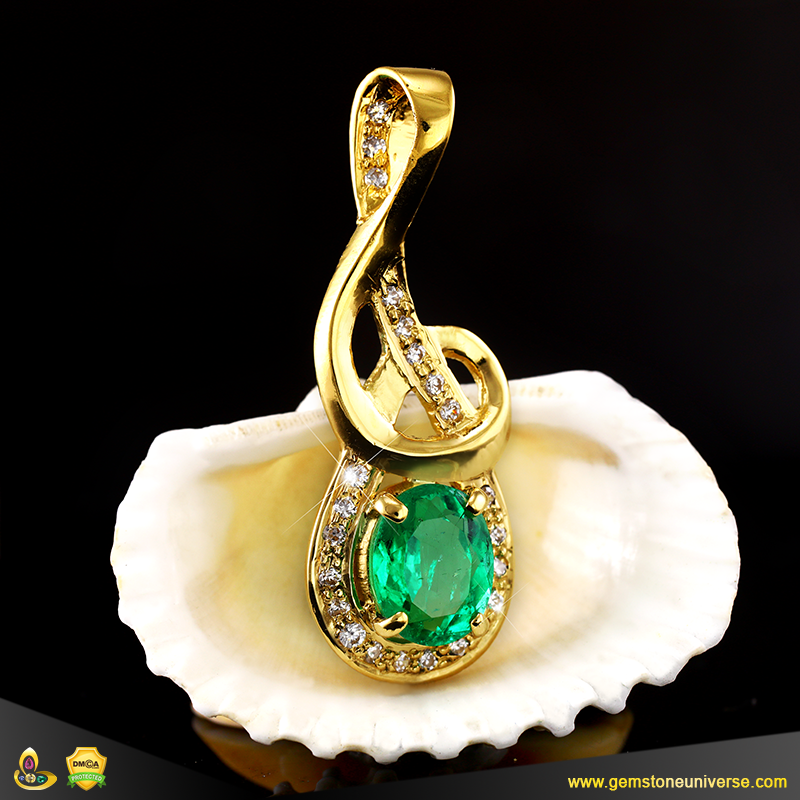 It is a gem that sparkles with a shimmery emerald green color with the perfect melee of Hue, Tone and Saturation. See and admire the miraculous power of Mother Nature at its finest best. Curious glances, numerous questions, admiration unbound. Get ready for what this mesmerizing gemstone of Mercury has to bring your way. Which is the best metal to wear Blue Sapphire? Blue Sapphire also known as the Neelam Stone is generally worn in Silver in majority of the cases and gives good results for most of the people. This powerful gemstone belongs to Lord Saturn and should be worn only after a thorough analysis of the birth chart and only on the recommendation of an expert Astro-Gemologist. 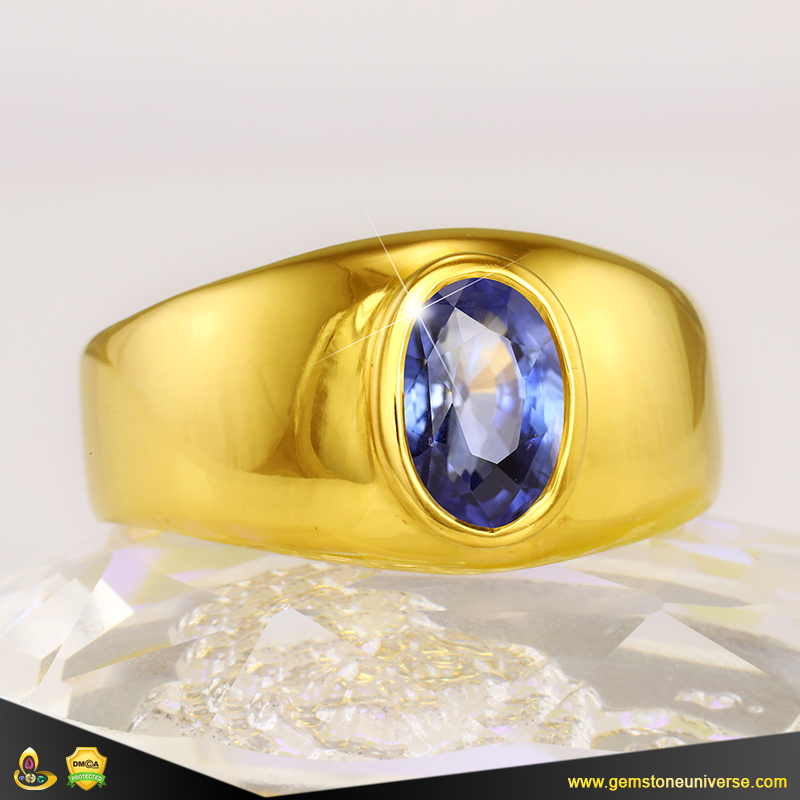 However, in certain cases the Blue Sapphire can also be worn in Gold. The horoscope conditions in which a Blue Sapphire can be worn in Gold are given in this resource. -Saturn in conjunction with Sun. – Saturn in conjunction with Jupiter. – Saturn in the sign of Leo. -Saturn in the sign of Sagittarius. Please note that in all of the above cases individual position of Saturn should be studied in detail and Saturn should be a powerful influencing planet in the horoscope. In the above mentioned cases a Blue Sapphire will give excellent results and bring desired changes in life. Please note that only a Jyotish Quality unheated Blue Sapphire of high clarity and good colour only will bring changes in life and is advocated the sacred texts. Comments Featured today is a blessed ultra clean unheated Blue Sapphire from the famed Ratnapura mines, that rarely reaches retail and is at the apex of the Gem pyramid. Beautiful color with just the perfect melee of hue, tone and saturation make it ultra luxurious, rare and royal. Couple that with near eye clean clarity and precision scintillating cut and you get a Jyotish Gemstone beyond compare. Picked from a Very small ultra rare lot for the chosen few. A Gemstone fit to be classified as a collectible and handed from one generation to another. Get the Saturn blessings of dedication, discipline, fortitude and get ready for positive life changes. This Blue Sapphire passes the touchstone test of true Jyotish Gemstones and shall deliver the top results that only Jyotish Gemstones are capable of. Set in high 22 caratage Gold signet ring, the golden allure contrasts sharply with the royal blue and bring a maturity in colour. See the lustre and fall in love with true Jyotish Gemstones. Can I wear Blue Sapphire? How to test a Blue Sapphire? Tips for making a Blue Sapphire suit you. Is it true that Gemstones have a life span & stop being effective after their life span? Instead of using Lifespan and going by the intent of the question it would be better to use the term, “Period of Maximum Effectivity“. 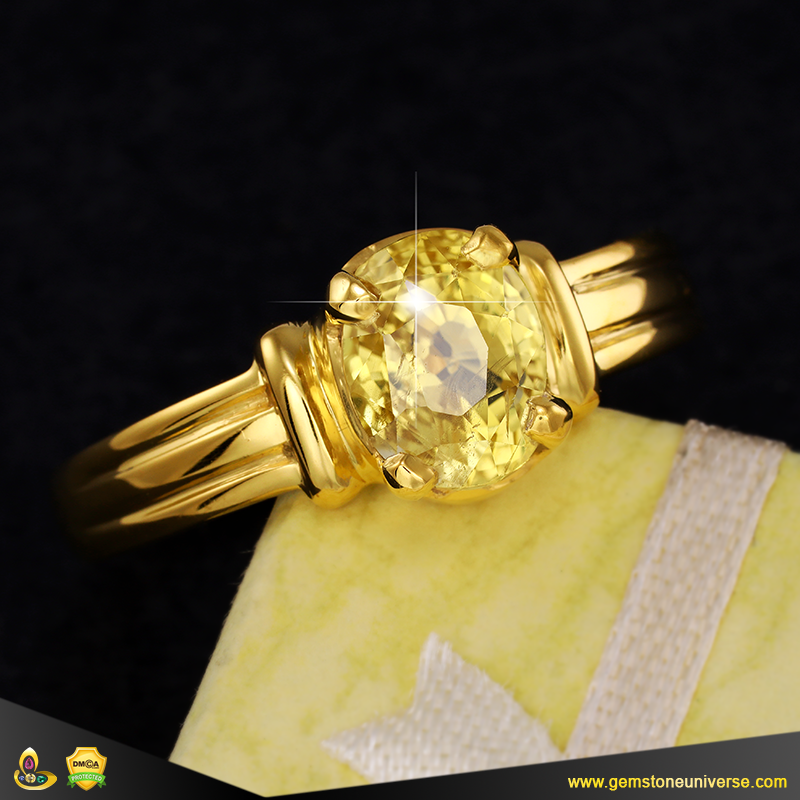 A Gemstone can be called as a Gemstone only when it has three attributes- Precious, Rare and Durable. Going by the above all real Gemstones except for organic ones like coral and pearl can have infinite life spans provided they are stored carefully and kept free from damage etc. Now that we can say that a Gem can have an infinite life span, each Gem is maximum effective for planetary & astrological benefits for a person for a fixed length of time. Natural Pearl 2 Years 2 Months and 27 days. All Uparatnas/ Semi Precious superior alternative gemstones have a maximum effective life span of 3 years. Once this period of wearing is over the Individual should go in for a new Gemstone and it will again be astrologically effective for the time period stated above. 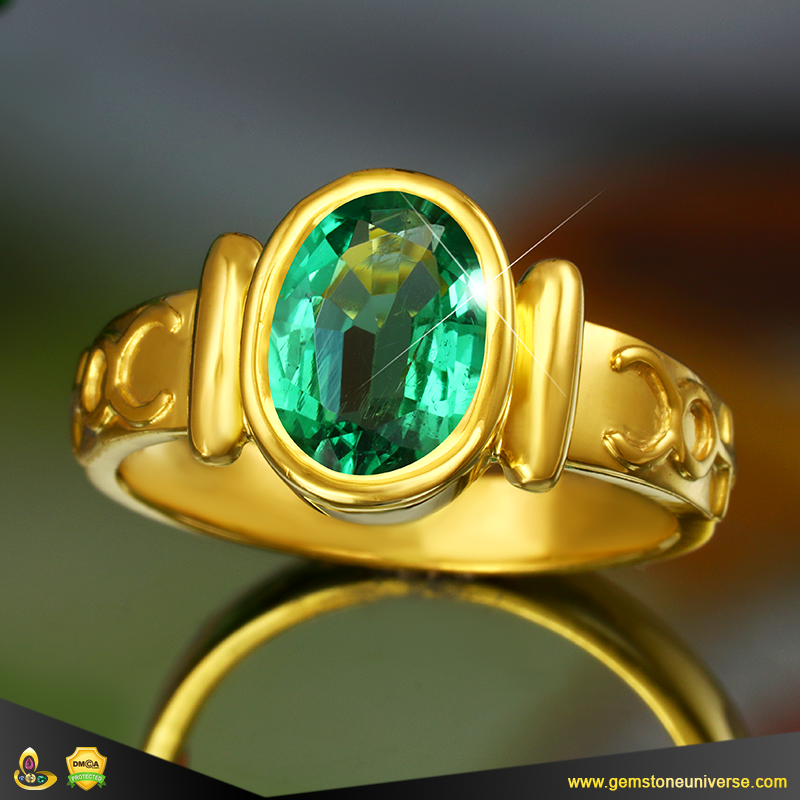 In this period of maximum effective lifespan the gemstone will bestow the maximum benefits to the individual. Now as discussed earlier about definition of Gemstones and lifespan the same Gemstone will be effective for a new person again for the period of maximum effectivity. Comments Take a look at the Video of this fantastic Unheated White Sapphire Venus Talisman and you will instantly know why Jyotish Gemstones are so special and bring in special changes in a person’s life. Scintillating Emerald cut White Sapphire brimming with purity and absolutely no tints which is very rare. Cut and polished in one of Europe’s top Lapidary, this crystal has a clarity of over 97%( Very Rare in an Unheated Gemstone) and full of radiance and lustre. The scintillating halo of American Diamonds around the unheated white sapphire gives it is sterling character and an unmatched panache. It is Gems like these that bring the so called powerful changes in an Individual’s life. What is the minimum carat weight of Yellow Sapphire/ Blue Sapphire for astrological benefits? No standardized text on Gemology or Astrology speaks of the weight of the gem that produces the best results. All sacred texts just emphasize on Gem quality, lack of treatments and lack of flaws. That being said any Gem that has above qualities shall deliver results even though some believe that a gem of 2 carats size is adequate carat weight. Why are Jyotish Gems rare and why do they produce excellent results. Comments Welcome to the world of Jyotish Gem Powers and the miracles of Planetary Gem Therapy. What you see here in this beautiful and dainty heart shaped Blue Sapphire from Lot” Srihan” is a magnificent rarity, a mammoth powerhouse of Sattvik Saturn Energy and a potent instrument of destiny recalibration. Fully Natural and Unheated Blue Sapphire from Sri Lanka that will leave you stunned and instil into you that, Nothing is impossible. 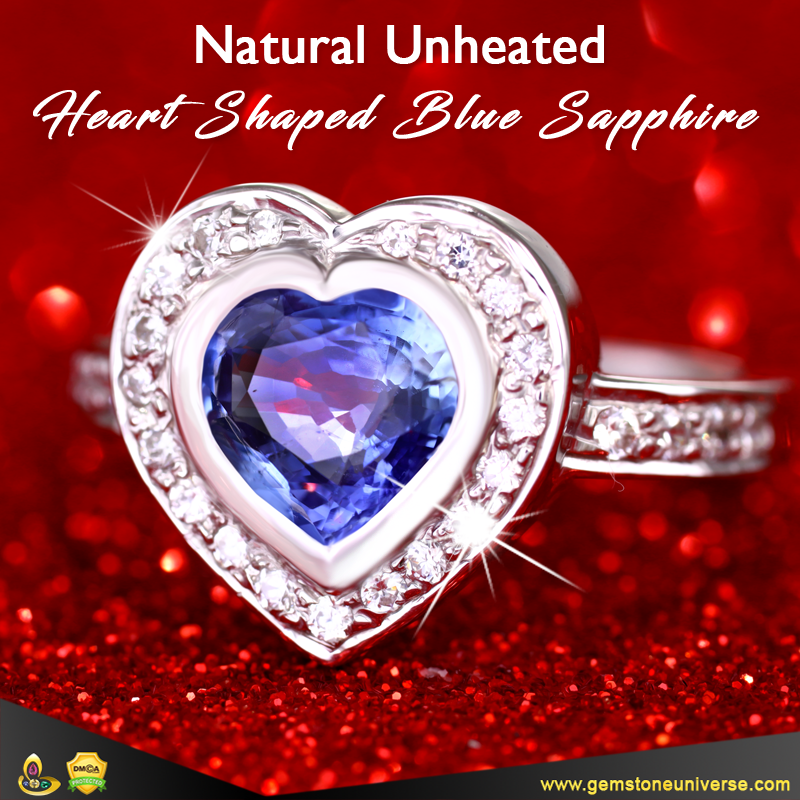 See the astounding clarity, the rare heart shaped, beautiful serene river like blue colour spread evenly in the sapphire and excellent carat weight. 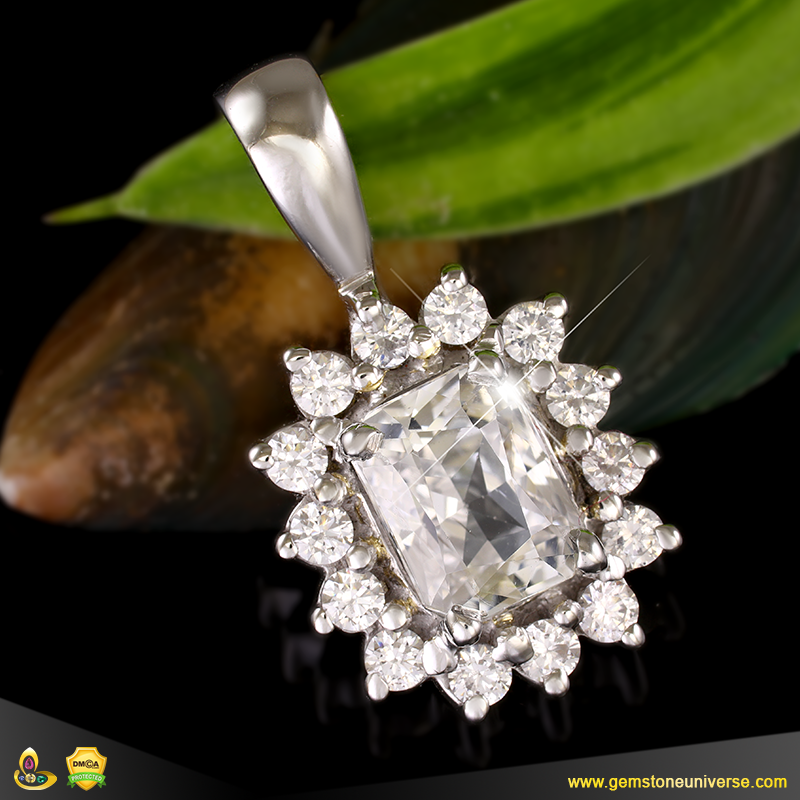 This Gem is the epitome of a Jyotish Gemstone and will deliver excellent results to its owner. Imagine owning a treasure that was formed millions of years ago in extreme temperature and pressure and has all the magical elements that are desired in a Jyotish Gemstone! There will be no room for dullness, negativity and disharmony in life when the magic is spun by such a pristine pure gem. Premium Ceylon Blue sapphire from the Ratnapura mines of Sri Lanka. Fully natural and untreated this gem with precision cut for maximum light movement is a part of the lot Srihan. This exotic shaped gem has a rich blue color and great clarity. With amazing powers, this gemstone has an abundance of Jyotish powers and a welcoming Saatvik aura! What Gemstone is good for business and financial development? Is it wearing a yellow sapphire or an emerald stone? Mercury is the planet of Business, finance and communication and its Gemstone is Emerald. 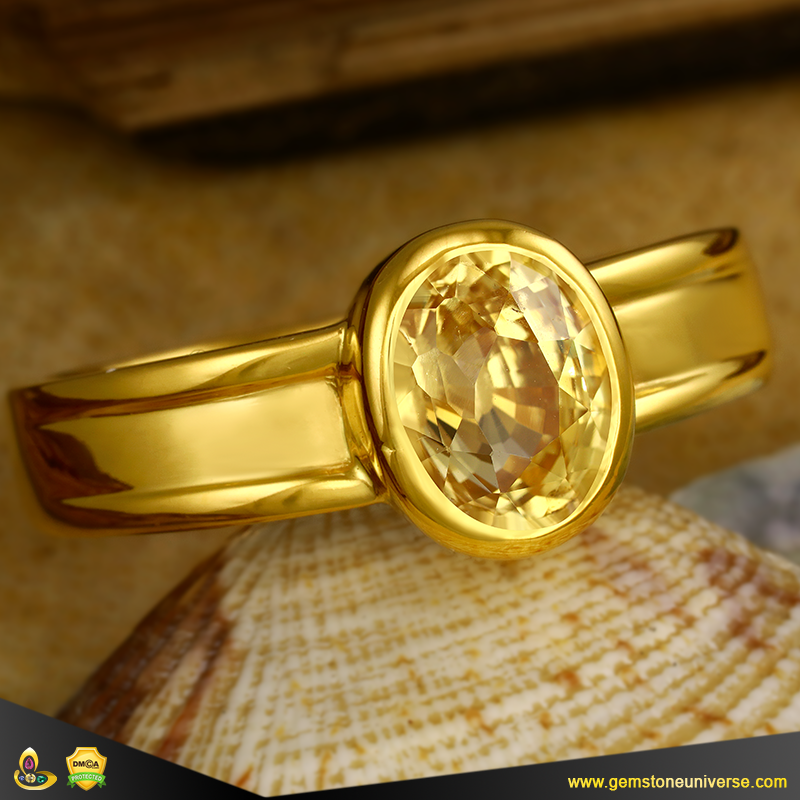 Jupiter is the planet of abundance, prosperity, auspicious wealth and wisdom and its gemstone is Yellow sapphire. Both Gemstones if of Jyotish Quality have the capacity to bless with wealth gain, business and finance development but it will depend on these planets positions in the birth chart. If the planet in any way gets connected with the 2nd house, 11th house, 10th house, 9th house or 5th house and is posited auspiciously then that particular gemstone will bring financial abundance and that will vary as per horoscope. Comments For those whom nothing but the Best will do – this is the Emerald for you from the Lot Samarjit. A wonderful premium Gem and Jewellery quality Mercury Emerald Talismanic Ring with sacred symbols of Mercury inscribed on the sides of the ring and the two sealed tubes carry the sacred ash of Apamarga. This is the quality of a gemstone described in ancient texts like the Garuda Purana and Agni Purana that deliver powerful results. The planetary herb used for Mercury is Apamarga also known as the Devil’s Horsewhip, and belongs to the Amaranth group. Its botanical name is Achyranthes aspera. The plant is very versatile in the sense that its several parts are used to treat ailments ranging from ophthalmic troubles to digestive and skin trouble as well. 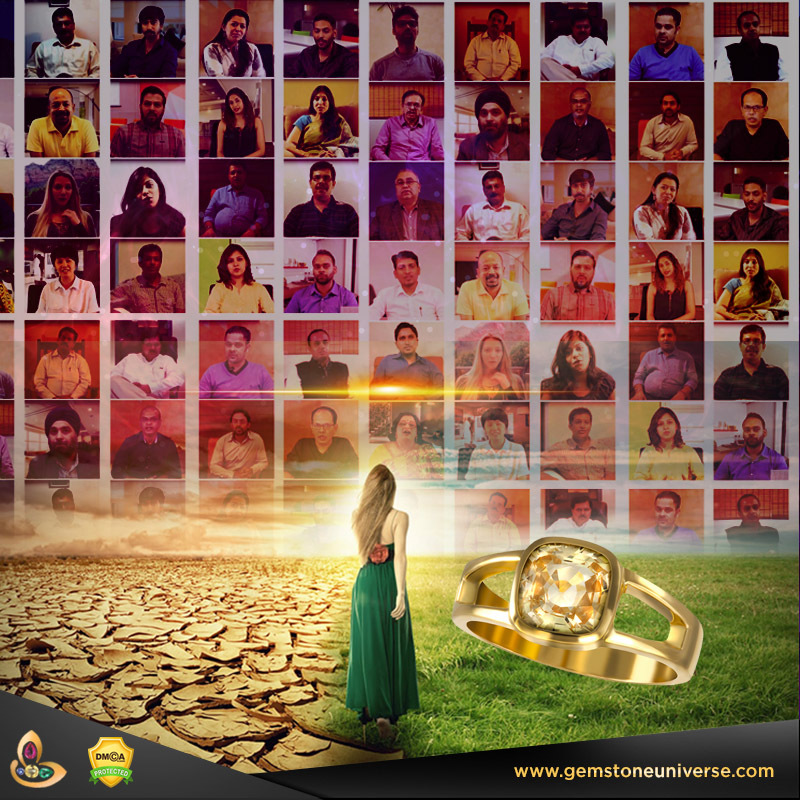 Enjoy True Jyotish Gemstones and Sacred Planetary Gem Therapy with Gemstoneuniverse. It was a delight to make this customized talisman and it is a delight that the awareness of pure Jyotish Gemstones and Gem therapy is spreading in India and people now able to understand and appreciate the difference between a stone, gemstone and a Jyotish Gemstone.